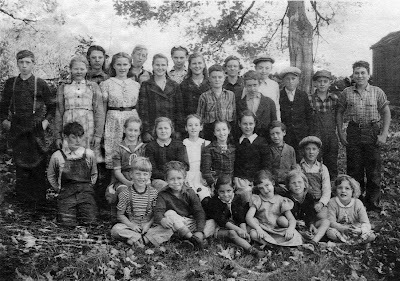 Of particular interest in a blog about Whipples is that most everyone in the photo is a related to Noah Whipple and the Rogerene Whipples in some way. How sweet is was to see the Lambtown School students with Miss Sutherland. I have the later picture of the Lambtown students with Mrs Whipple. I lived in the farmhouse just east of the little red school house. Usually I would be playing outdoors as the children passed enroute to school.Well,One wonderful day Pearl Watrous stopped to ask my mom if I could go to school with her. Mother agreed and off I went Since there was no kindergarten ,I became a first grade student at the age of 5.Many years have passed and I've lived in several of these united states, but, during visits back "home" I never fail to make a trip to Lambtown Rd and remember the precious days at that little red school house. Thanks for your comment! This is the reason I created the Whipple Website blog! Receiving this sort of positive feedback reinforces my decision to create the blog. I have been trying to find anyone with information or photos of Enoch and Delight Whipple of Ledyard, CT. These people brought up my great great grandfather, George Montgomery. My grandmother carried the name Whipple for a short time. Her name was Racheal Montgomery married to Herbert S Sturgis. Enoch Whipple is in the Whipple Genweb at http://whipple.org/21032 . Delight is at http://whipple.org/21065 . If you scroll to the bottom of their pages, you will see a photo of their gravestone, as well as some possible information sources.